The forum will be held in the Leech Tishman Pasadena office. 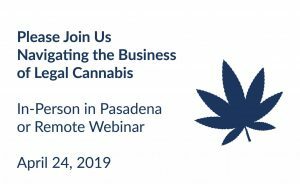 Partner Christopher Gonzalez, along with members of the Cannabis Team, will provide insight into the complex business and legal issues underlying cannabis operations. Companies operating in the cannabis industry must address changing regulations, varying state laws, considerations for federal law, insurance coverage and risk management, investment and governance concerns, applications for grower and processor & dispensary licenses, and more. Start-ups and entrepreneurs also face additional legal challenges as they try to grow in this emerging marketplace. California MCLE credit will be available.